Examining the architecture behind the world's most successful warehouse retailer. It is understandable why most people think of their local Costco warehouse as a great big box. After all, it has four walls and a roof, the classic definition of a “box.” But what isn’t always apparent is how form and function drive design with the goal of efficient building operations and a dependable, satisfying customer experience. The overall design and purpose of the architectural details and materials integrated into Costco’s warehouses serve to improve building performance, allow for efficient constructability and decrease both life cycle and daily operational costs. Examples may include insulated exterior wall panels that improve the building’s energy efficiency or a reflective metal roof that reduces the “heat island effect” on hot summer days. Regardless of their visibility to the consumer, new equipment, building systems and design details undergo extensive cost-benefit analysis before being implemented. Costco has consistently challenged their design and construction teams responsible for delivering each new project to cultivate cost-saving solutions wherever possible, while achieving high marks for quality. This mindset toward development is consistent with their overall business ethos that has driven their success globally to become the number three retailer in the world. Being on a global scale means that small decisions can have very large impacts and may offer opportunity for improvement to the business. A topic that headlines discussions at every level of our society is the natural environment and what can be done to offset, mitigate or improve our impacts. Costco recognizes that investing in the research and design of a project allows them to develop sustainable solutions that not only lessen the effects on the environment, but also creates reductions in the operational costs of their warehouses. 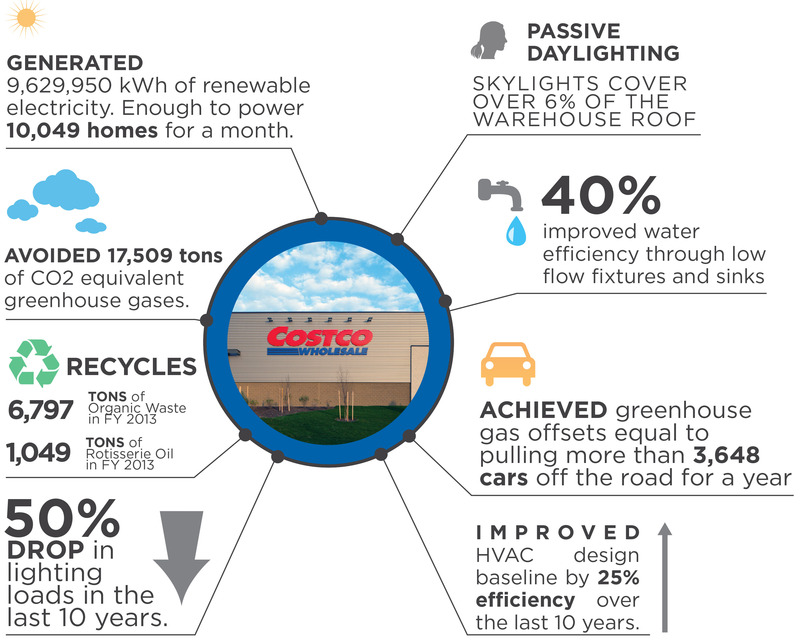 Case in point, Costco’s master building design or prototype integrates over 200 Energy Star rated skylights covering 6 percent of the warehouse roof, providing an abundance of natural light, while reducing energy consumption. Spaced between the skylights are high-performing LED dimmable light fixtures that, with the help of an energy management tool and photometric sensors, adjust the fixture’s output. Depending on the season and the amount of available natural day light penetrating the skylights, members may observe very few fixtures turned on. This successful lighting strategy has resulted in a 50 percent reduction in warehouse lighting loads over the last ten years. In 2009, Costco evolved the sophistication of their building systems to address waste from the chicken rotisserie process. Specifically, the grease by-product from the roasting process is now filtered through a recovery system specially designed to prevent the waste from ending up in landfills and sanitary sewer systems. The grease is captured and stored temporarily before being sold to a business for processing into biofuels. Recent MG2 projects illustrate how adapting designs to integrate with local building character helps Costco introduce itself to a particular city. A strong example of such a project being well received by a community exists in New Orleans, Costco’s first location in the state. Completed in 2013, the 15 acre property had been vacant since Hurricane Katrina. The site had a long retail history. It was formally the site of New Orleans’ largest retail center, Carrollton Shopping Center, built in 1961 and once home to Woolworth’s, Winn Dixie, A&G Cafeteria and a small Dillard’s prototype. Costco asked MG2 to design a structure that would reflect the city’s architectural heritage while delivering their highly successful and identifiable warehouse brand. In reviewing city precedents, two specific design elements served as inspiration for the team: Shading features, including louvers that cast long shadows on sunny days, and the delicate, lacy steel work of porches commonly found on residential estates throughout New Orleans. The porch represents a portion of the home shared with neighbors as well as strangers. The overhang makes it a welcome respite from the elements and being invited onto a porch is a sign of hospitality. The porch also serves as a practical and sustainable application to the home, shading the house and allowing the maximum amount of glazing to face outward. It allows the interior and exterior to meld in a transition to the outdoors. These design features would manifest themselves in the building’s façade, most prevalently in the outdoor food service and seating area. Another strong architectural element was the on-site fueling facility that borrowed its design inspiration from a local historic train station. Historically, Costco’s preferred warehouse site has been 15 acres with parking for 750 cars and 148,000 SF of building area. In recent years however, the company’s business model has evolved to include the development of multi-story warehouses in mixed-use urban locations. These transit oriented warehouses allow Costco to reach new demographics of consumers and expand their membership base by the hundreds of thousands. While these urban warehouses are a departure from Costco’s ideal prototypes, the functions are designed to operate as close to standard suburban units as possible. Although often smaller in footprint, each of these reduced sites presents their own unique design challenges. This is especially true of international projects, which prove to be more atypical when compared against the majority of domestic Costco developments. A major site design consideration for international locations is traffic control and traffic management and establishing how they can promote both an efficient site/building for the owner and a pleasant experience for the member. As an example, the minimum parking target for projects in South Korea is 1,200 stalls on sites that are typically one-fifth the size of a U.S. site. Projects in this country are also often restricted to street access on only a small portion of a single side of the property, making on and off site traffic patterns absolutely critical. Add in factors such as receiving truck traffic, site programming, circulation for the recently introduced fuel stations and needing to maintain adherence to Costco’s simple but rigid master interior merchandising programs and adjacencies, and these diminutive sites present some not-so-diminutive challenges. It is during these projects that MG2’s expertise and ability to deliver transformative solutions are on full display. Sites in Asia are consistently located in areas of new urban development, often with proposed or recently constructed high-density residential properties flanking the site. In these situations, the appearance of the project is typically subject to rigorous and critical design review by the jurisdiction and frequently require a neighborhood committee review. As a result, MG2 is increasingly being asked to design the tops of the buildings to mask their use and massing from the views of nearby residential properties. We accomplish this by using green materials, plantings, screens, and other structures to simulate a park-like environment. When you begin to dissect a Costco warehouse, it becomes evident that a great deal of thought is given to every aspect of planning and design. Whether the average member recognizes it or not, “the box” is an extremely complex structure designed to deliver an exceptional customer experience, while simultaneously maximizing operational performance. Preserving the relevance of brick and mortar development is an increasing challenge for many large format retailers. New retail projects are increasingly dense and have fewer standalone solutions. In spite of this, the MG2 team has proven their ability to deliver compelling design solutions, adapting the warehouse to every type of retail environment. With Costco’s vision and MG2’s design expertise, these so-called “boxes” are the major reason behind both companies’ success in today’s competitive marketplace. Get new Insights delivered directly to your inbox at a frequency you determine. Unsubscribe at any time.